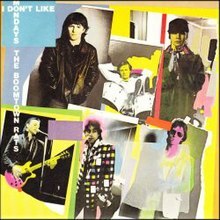 (1978) "I Don't Like Mondays"
"I Don't Like Mondays" is a song by Irish group The Boomtown Rats about the 1979 Cleveland Elementary School shooting in San Diego. It was released in 1979 as the lead single from their third album, The Fine Art of Surfacing . The song was a number one single in the UK Singles Chart for four weeks during the summer of 1979,  and ranks as the sixth biggest hit of the UK in 1979. Written by Bob Geldof and Johnnie Fingers, the piano ballad  was the band's second single to reach number one on the UK chart. According to Geldof, he wrote the song after reading a telex report  at Georgia State University's campus radio station, WRAS, on the shooting spree of 16-year-old Brenda Ann Spencer, who fired at children in a school playground at Grover Cleveland Elementary School in San Diego, California, on 29 January 1979, killing two adults and injuring eight children and one police officer. Spencer showed no remorse for her crime; her full explanation for her actions was "I don't like Mondays. This livens up the day". 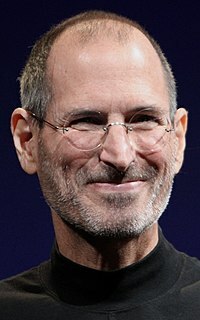 Geldof had been contacted by Steve Jobs to play a gig for Apple, inspiring the opening line about a "silicon chip". The song was first performed less than a month later. 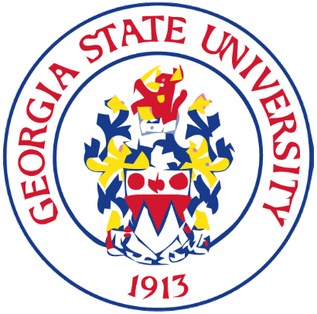 Georgia State University is a public research university in Atlanta, Georgia. Founded in 1913, it is one of the University System of Georgia's four research universities. It is also the largest institution of higher education based in Georgia and is in the top 10 in the nation with a diverse student population around 53,000 including approximately 33,000 undergraduate and graduate students at the main campus downtown as of 2018. WRAS is a public FM radio station in Atlanta, Georgia. It is licensed to Georgia State University and funded by the university's Student Activity Fee. Its schedule is split between public radio programming from Georgia Public Broadcasting airing from 5 a.m. to 7 p.m. and college radio programming airing from 7 p.m. to 5 a.m. 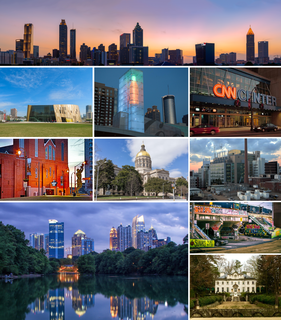 The Album 88 and 88.5 GPB Atlanta formats are both available 24 hours a day on separate internet streams, and Album 88 is available full-time on WRAS's HD-2 subchannel. Despite reaching number-one in the United Kingdom, it only reached number 73 on the US Billboard Hot 100. The song was played regularly by album-oriented rock format radio stations in the United States throughout the 1980s, although radio stations in San Diego refrained from playing the track for some years in respect to local sensitivities about the shooting. On 9 September 1981, Geldof was joined on stage by fellow Boomtown Rat, Johnnie Fingers, to perform the song for The Secret Policeman's Ball sponsored by Amnesty International. A recording of that performance appears on the 1982 album, The Secret Policeman's Other Ball . The Boomtown Rats performed the song for Live Aid at Wembley Stadium in 1985. This was the band's final major appearance. On singing the line, "And the lesson today is how to die", Geldof paused for 20 seconds while the crowd applauded on the significance to those starving in Africa that Live Aid was intended to help. "I Don't Like Mondays" was subsequently covered by Tori Amos on her 2001 album Strange Little Girls and later by G4 on their 2006 album Act Three . One Wild Night Live 1985–2001 is a live album by the American rock band Bon Jovi, released in May 22, 2001. The album includes live covers of Neil Young's "Rockin' in the Free World" and performance of The Boomtown Rats' "I Don't Like Mondays", with a guest appearance by their lead singer Bob Geldof. Though stating it was recorded from 1985-2001, only two of the songs were recorded before 1995. The album charted at #20 on The Billboard 200. The Boomtown Rats is The Boomtown Rats' debut album and included the Rats' first hit single, "Lookin' After No. 1", as well as the subsequent single, "Mary of the 4th Form". The album peaked at No. 18 in the UK Albums Chart in 1977. 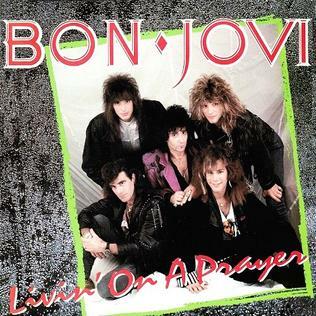 "Livin' on a Prayer" is Bon Jovi's second chart-topping song from their third album Slippery When Wet. Written by Jon Bon Jovi, Richie Sambora, and Desmond Child, the single, released in late 1986, was well received at both rock and pop radio and its music video was given heavy rotation at MTV, giving the band their first No. 1 on the Billboard Mainstream Rock chart and their second consecutive No. 1 Billboard Hot 100 hit. "Rat Trap" is a single by The Boomtown Rats, which reached No. 1 in the UK Singles Chart for two weeks in November 1978, the first single by a punk or new wave act to do so. It was written by Bob Geldof, and produced by Robert John "Mutt" Lange. It replaced "Summer Nights", a hit single for John Travolta and Olivia Newton-John from the soundtrack of Grease, at number one in the UK chart after "Summer Nights" seven week reign at the top. 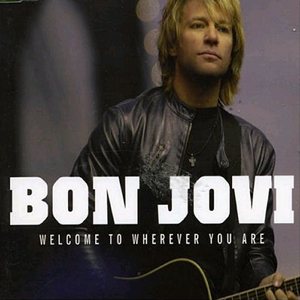 "Welcome to Wherever You Are" is a song by American rock band Bon Jovi from their 2005 album, Have a Nice Day. It was released as the album's third single in the US, following "Have a Nice Day" and "Who Says You Can't Go Home", while worldwide it was released as the album's second single. "Janie, Don't Take Your Love To Town" is a song by American rock singer Jon Bon Jovi. It was released as the third single from his second solo album Destination Anywhere in 1997. The song features a music video which was released on the DVD Destination Anywhere: The Film. Commercially, the song reached number 13 on the UK Singles Chart and number 18 on Canada's RPM Top Singles chart. 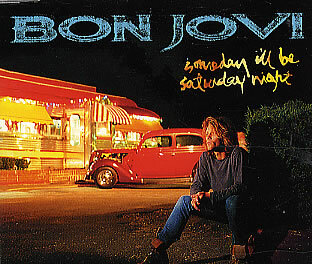 "Someday I'll Be Saturday Night" is a single by American rock band Bon Jovi. It is taken from their greatest hits album Cross Road and reached number seven on the UK Singles Chart. "Like Clockwork" is a single by The Boomtown Rats. It was the band's first to reach the Top Ten in the UK Singles Chart, peaking at No. 6. "Mary of the 4th Form" is the second single by The Boomtown Rats. It was the first song taken from the band's first album The Boomtown Rats but the single is a different, re-recorded version from that on the album and 19 seconds longer. On French and Dutch releases of the single, "Do the Rat" was the A-side. The song's theme, of a teacher's sexual attraction to a pubescent girl, who behaves in an overtly sexual manner, was resonated in the Police song "Don't Stand So Close to Me". "Lookin' After No. 1" is the first single by The Boomtown Rats. It appears on their first album The Boomtown Rats. The single was released in August 1977 after the band had performed a five date tour supporting Tom Petty and the Heartbreakers. "Lookin' After No. 1" was the first so-called new wave single to be play listed by the BBC and the Boomtown Rats subsequently became the first new wave band to be offered an appearance on Top Of The Pops performing the song. The song reached number 2 on the Irish Singles Chart and spent nine weeks in the UK Singles Chart reaching a peak of number 11. Different covers were produced for releases in the Netherlands and Japan. Reviewer David Clancy described the song as having a "breakneck sneering selfishness". The discography of Irish new wave group The Boomtown Rats consists of six studio albums, five compilation albums, 20 singles and three video albums. The Boomtown Rats' debut release was the 1977 single "Lookin' After No. 1". The group's next single "Mary of the 4th Form" was released in the same year, along with their self-titled debut album. Back to Boomtown: Classic Rats Hits is the fifth greatest hits album by Irish band The Boomtown Rats. It was released by Virgin EMI on 9 September 2013. The album was announced in June 2013 along with news of the band's UK and Ireland tour. Back to Boomtown: Classic Rats Hits is the first album to be released since The Boomtown Rats reunited and the band's first greatest hits album since 2003's The Best of The Boomtown Rats. The album contains fourteen of the group's singles, as well as two new tracks, "The Boomtown Rats" and "Back To Boomtown". The digital version of the album features two additional songs. Following its release, Back to Boomtown: Classic Rats Hits debuted at number thirty-five on the Irish Albums Chart. ↑ "The Boomtown Rats - I Don't Like Mondays". 45cat.com. Retrieved 27 March 2019. ↑ "Record World" (PDF). 20 October 1979. p. 36. Retrieved 12 December 2018. ↑ Roberts, David (2006). British Hit Singles & Albums (19th ed.). London: Guinness World Records Limited. pp. 370–1. ISBN 1-904994-10-5. ↑ "Top 100 1979 - UK Music Charts". Uk-charts.top-source.info. Retrieved 2015-10-20. ↑ Hermann, Andy (25 January 2017). "10 Underrated '80s Bands You Need to Hear Now". L.A. Weekly. 1 2 3 "BBC Radio 6 Music - Classic Singles, I Don't Like Mondays". BBC. ↑ Mikkelson, Barbara (29 September 2005). "Urban Legends Reference Pages: Music (I Don't Like Mondays)". snopes.com. 1 2 3 Clarke, Steve (18–31 October 1979). The Fastest Lip on Vinyl. Smash Hits . EMAP National Publications Ltd. pp. 6–7. ↑ Bob Geldof reveals the truth of "I Don't Like Mondays"!. Event occurs at 2:08. Retrieved 8 April 2019. ↑ Whitburn, Joel (2000). Top Pop Singles 1955-1999. Record Research Inc. p. 65. ISBN 0-89820-139-X. ↑ "I Don't Like Mondays". Songfacts.com. Retrieved 2009-04-05. ↑ "Australian-charts.com – The Boomtown Rats – I Don't Like Mondays". ARIA Top 50 Singles. ↑ "Austriancharts.at – The Boomtown Rats – I Don't Like Mondays" (in German). Ö3 Austria Top 40. ↑ "Ultratop.be – The Boomtown Rats – I Don't Like Mondays" (in Dutch). Ultratop 50. ↑ "Image : RPM Weekly - Library and Archives Canada". Bac-lac.gc.ca. Retrieved 2015-10-20. ↑ "Musicline.de – The Boomtown Rats Single-Chartverfolgung" (in German). Media Control Charts. PhonoNet GmbH. ↑ "Chart Track: Week 29, 1979". Irish Singles Chart. ↑ "Dutchcharts.nl – The Boomtown Rats – I Don't Like Mondays" (in Dutch). Single Top 100. ↑ "Charts.nz – The Boomtown Rats – I Don't Like Mondays". Top 40 Singles. ↑ "Norwegiancharts.com – The Boomtown Rats – I Don't Like Mondays". VG-lista. ↑ "SA Charts 1965–March 1989" . Retrieved 1 September 2018. ↑ Salaverri, Fernando (September 2005). Sólo éxitos: año a año, 1959–2002 (in Spanish) (1st ed.). Spain: Fundación Autor-SGAE. ISBN 84-8048-639-2. ↑ "Swedishcharts.com – The Boomtown Rats – I Don't Like Mondays". Singles Top 100. ↑ "Swisscharts.com – The Boomtown Rats – I Don't Like Mondays". Swiss Singles Chart. ↑ Steffen Hung. "Forum - 1970 (ARIA Charts: Special Occasion Charts)". australian-charts.com. Archived from the original on 2 June 2016. Retrieved 20 October 2015. ↑ "Top Selling Singles of 1979 | The Official New Zealand Music Chart". Nztop40.co.nz. 1979-12-31. Retrieved 2016-10-15. ↑ "Top 20 Hit Singles of 1979" . Retrieved 2 September 2018. "Mary of the 4th Form"